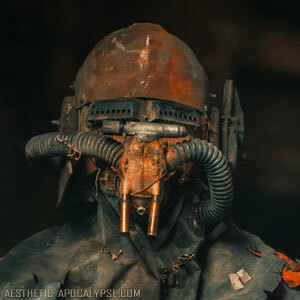 ​These are all the post-apocalyptic helmets and masks I (Ole) made from 2015 until now. 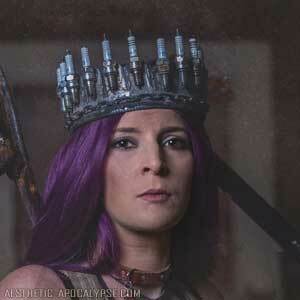 There is a lot of trial and error before a good one leaves the workshop. Building these is just like a puzzle for me. 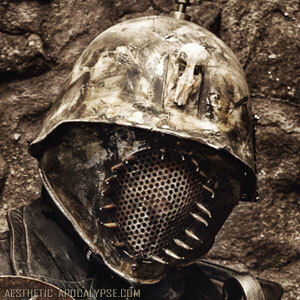 I know that I have material for another 1000 iconic helmets. I have “just” to put the right things on the right place. 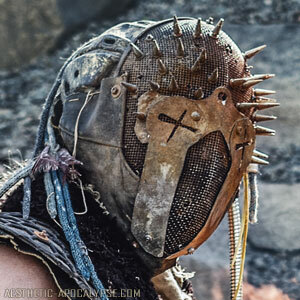 Made from a fencing mask, an armor hood, spikes, leather from a winter hood, woolen dreadlocks and scrap metal. I initially had in mind to let the eye parts coming down from the upper head. Later i reversed it and got something that reminds a bit of the Witchking from Lord of The Rings. 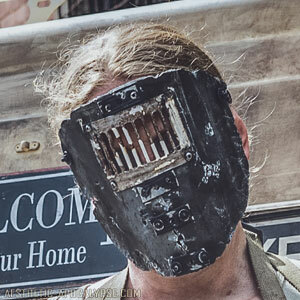 The base of this mask is a hook-in outlet pipe with a gasmask holding where i attached some scrap metal parts and the goggles. 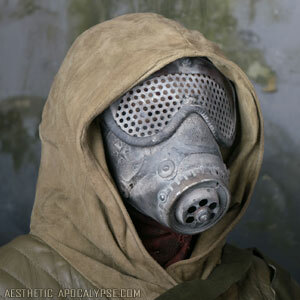 The helmet is a german firefighter helmet. The base is made from perforated tape. 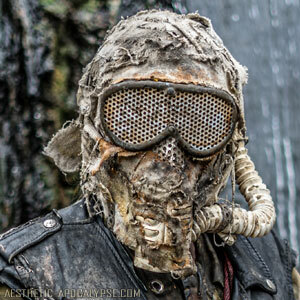 I attached the goggles and some scrap metal parts and wrapped it with rags. 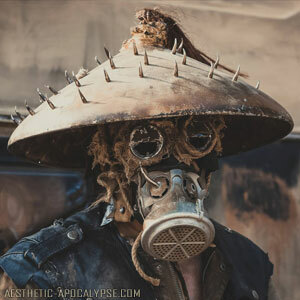 A lampshade helmet. More information on this is on the start page. 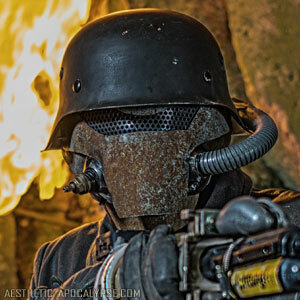 i cut sheet metal to make the front and attached it to a german wehrmacht replica helmet. 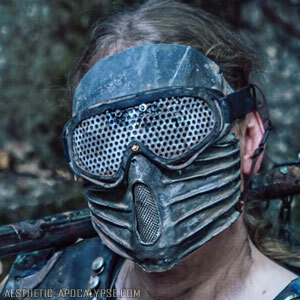 This mask is made drom an elbow pipe, sheet metal and skiing goggles with perforated sheet. 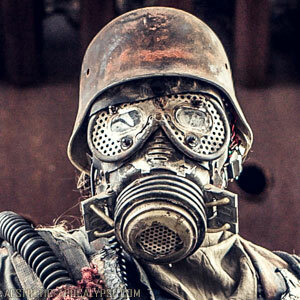 One of the main characters of our post-apocalyptic movie we are planning. 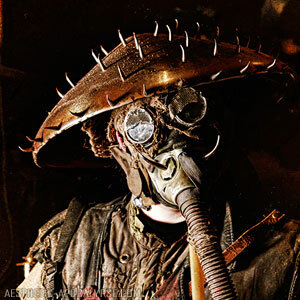 Just a gasmask part, welders goggles and a hat. 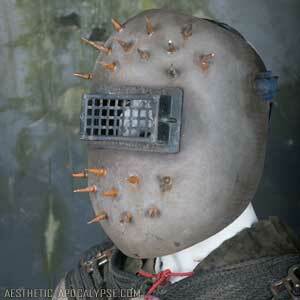 Made from an elbow pipe, spikes, perforated sheet and a german red cross helmet. 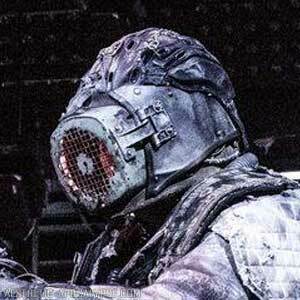 The base is a grid made from perforated tape, attached elbow pipe part, headphones and i hood from a transparent raincoat. 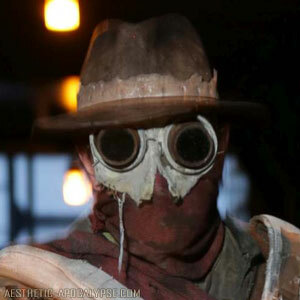 The base is a grid made from perforated tape, attached goggles, some scrap metal parts and wrapped it with leather straps and rags. 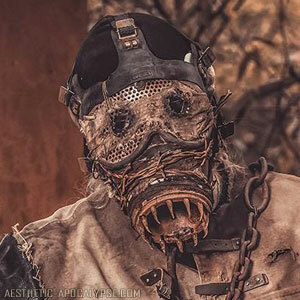 Maybe inspired by the Sandpeople from Star Wars. Just sheetmetal with a scrap metal grill. 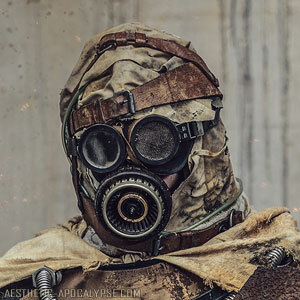 Basically the same build like the Old Man Atom helmet: a hook-in outlet pipe with a gasmask holding where i attached some scrap metal parts, fake barb wire, spikes, rags and the goggles. 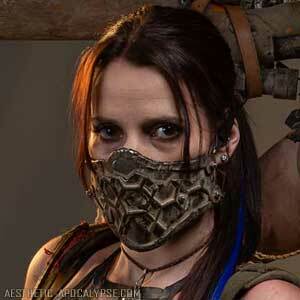 The base is a grid made from perforated tape, attached goggles, the mouth part is a CPU Cooler. 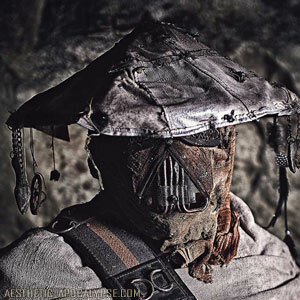 The hat is also built with perforated tape and rags and some stuff hanging from it. 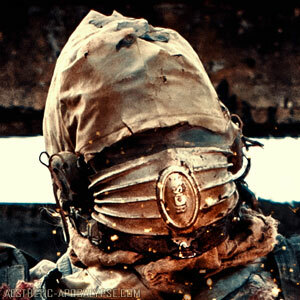 A lampshade helmet. More information on this is on the start page. 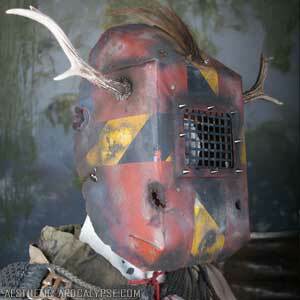 This is the second helmet since I started crafting post-apocalyptic helmets. 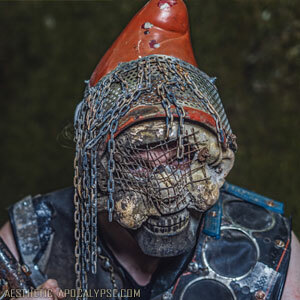 The base is a heat protection helmet with lots of bits and scrap metal parts attached. The eyes are drawer handles. 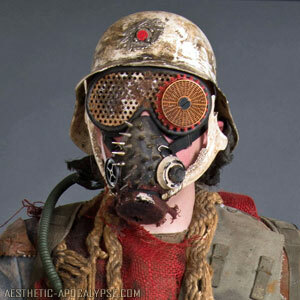 German red cross helmet, goggles, scrap parts, dust protection mask, jawbones and some rags and stuff. 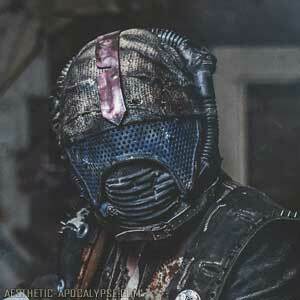 This is the first helmet i crafted. 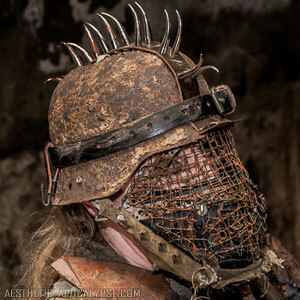 Used old Wehrmacht helmet and fence wire. 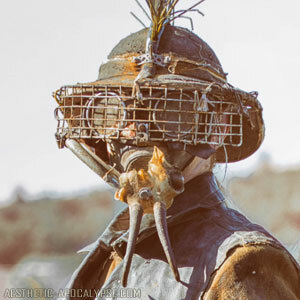 A simple womens mask made from a hook-in outlet pipe and some scrap.